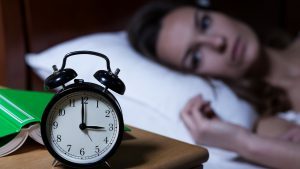 Insomnia has become a major problem for modern society, with hundreds of millions of people around the world reporting serious difficulty falling asleep. According to research conducted at the University of California, San Diego, chronic insomnia leads to a host of daytime problems as well. These include trouble with memory, difficulty focuses and delayed reaction times. Alarm clock on night table showing 3 a.m. There are strong psychological components to insomnia. To begin with, when you have trouble falling asleep, the worst thing that you can do is to lie there worrying about your sleeplessness. Doing so causes the brain to associate your bed with worry rather than with rest. If you can’t sleep, then you’re better off getting out of bed. Face the issues that are causing anxiety, as this often helps to put them in perspective. Use breathing exercises and meditation techniques to deal with anxiety. Share your concerns with someone else, whether that means seeking counselling or talking to a trusted friend. When it comes to issues that are causing you stress, take a moment to imagine what the worst that could happen is; it’s probably not as bad of a situation as it seems. Adjust your expectations so that they are more realistic. If you have trouble falling asleep, there could be direct correlations to the amount of exercise that you are getting. Research suggests that people who exercise report noticeable improvements in their quality of sleep. To that end, 20 to 30 minutes per day of aerobic exercise is an increasingly common prescription for insomnia patients, and doctors prefer it because it eliminates the need to prescribe potentially habit-forming medications. One of the secrets to falling asleep is getting in the right frame of mind first. There are plenty of effective techniques for falling asleep. These may include taking a warm bath, practicing yoga or reading a book in your favourite armchair. Just be sure that the activities you use to prep yourself for sleep don’t actually take place in the place where you intend to fall asleep (i.e. in bed). Eating too much or drinking alcohol or caffeine can disrupt your body’s sleep cycle. Indulging in food or alcohol can actually induce sleepiness; however, these activities also disrupt the body’s natural rhythms. Alcohol, in particular, may help you fall asleep initially, but you may end up waking up in a couple of hours when its effects wear off. Getting back to sleep at that point will be more difficult than ever. When sleep is elusive, the environment in which you are resting may be partially to blame. Reserve the bedroom for sleep and little else, so that there is no confusion in your body or mind regarding the room’s purpose. The room should be dark with a comfortable climate, and noise should be kept to a minimum. In addition, you may need to purchase a new bed that is better suited to your own comfort. Copyright © 2019 Health care tips. Powered by WordPress. Theme: Spacious by ThemeGrill.